If you believe that the Atkins diet and eating out are not compatible, think again! You can enjoy your favorite restaurant occasionally as long as you eat responsibly. It’s easy if you have the right tool. You have to watch what you order in a restaurant, especially since there are many carbs and hidden sugars in the dressings, gravies, and sauces. Fortunately, there is a quick reference guide to show Atkins dieters how to eat out yet still be within your daily carb count. 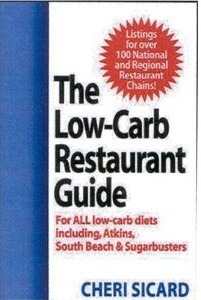 An Atkins restaurant guide, The Low Carb Restaurant: Eat Well at America's Favorite Restaurants ($9.95), by Cheri Sicard, who is the co-creator and editor of FabulousFoods.com, is not just for Atkins but also for all low carb diets including South Beach and Sugarbusters. In the book, each restaurant receives a modified review covering features such as what is positive about the menu for the Atkins dieter. The second and third sections, “The Bad” and “The Ugly,” cover the menu items you need to avoid ordering as well as the reasons why. The fourth section gives you “The Best Things to Eat” that will keep you faithful to the Atkins Diet. Like all good restaurant guides, Sicard’s book features a list of over 100 popular national and regional restaurant chains along with the Pros and Cons of their menus. This 6.7 x 4-inch book is designed to be carried with you, either in your purse or in your car, so that you’ll have it handy when going out to eat or stopping at a fast food joint. From McDonald’s and KFC, to Olive Garden and P.F Chang’s, this is a good reference book for staying on the Atkins Diet and eating out. This is a 2004 edition but hopefully the author will release an updated version soon since restaurants change their menus from time to time. But Sicard has thought of that, and included the website addresses of the main restaurants so that you can view the nutritional information of items on the menu that are not listed in the book. When ordering at a restaurant, it can be difficult to gauge exactly how many carbs, fats, and proteins you are getting, especially when most restaurants serve large — excessively large — portion sizes. Sicard offers helpful tips there too. As well as reminding you of the good carbs vs the bad carbs, there are tips for dealing with the amount of food you are served. The Beef with Broccoli at Panda Express, for example, may only be 11 grams of carbs, but hopefully your experience with Atkins will allow you to judge the proper portion size for yourself, and take the leftovers home. 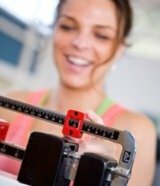 With this handy pocket guide, staying true to your Atkins diet and eating out a few times a week, can be stress-free and pleasurable while maintaining your weight management goals.